In 2011 we took some pictures of the world record balloon flight - you can see the images here. One of our images was actually used on the web page for the event. When I heard there was another attempt planned I knew that I needed to see it. 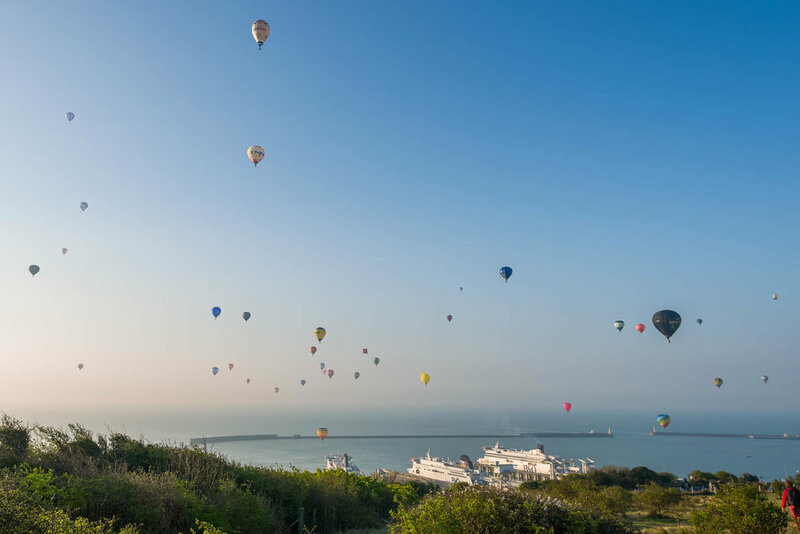 Seeing the sky full of hot air balloons is an amazing spectacle. The objective as a photographer is obviously to try and tell the story of the event which means trying to get a shot of as many balloons as possible over a landmark. The image as the balloons approached Dover Castle was quite nice but they were a little too far away. My favourite image is as they leave the White Cliffs and head over the harbour with the cross channel ferries in the foreground. This really is a tremendous event and I am pleased that the record attempt was successful. What is in a Kent Wedding Photographer's Camera Bag? A selection of photographs and the final video from Breast Cancer Now - Totally Shredded Workout. A visit to Margate for some vintage fashion photography on a very, very bright day. As a photographer, preparation and a routine to back up your customes images is essential. Video is becoming part of my working life. I am a photographer first, video man second. Where do I stand on this? A short post about my recent fashion shoot in Margate.